Richland Lutheran Cemetery is located on Dice Road between Fehn and Hemlock Roads, Hemlock, MI. The property belongs to our sister congregation, St. Peter Lutheran 2440 N. Rauchholz Road, Hemlock, MI. Burial privileges in Richland Lutheran Cemetery were given to Zion (Iva) congregation around 1896. Zion shares in the cost of upkeep and maintenance of the cemetery. The Board of Trustees of St. Peter is responsible for the maintenance and record keeping of the cemetery. No lots are available for purchase. Links to guidelines as to who can be buried at the cemetery and rules and regulations regarding grave markers, plantings, etc. can be read at the links below. Many of the people buried at the Richland Lutheran Cemetery are memorialized with stories/obituaries or pictures at FindaGrave.com. 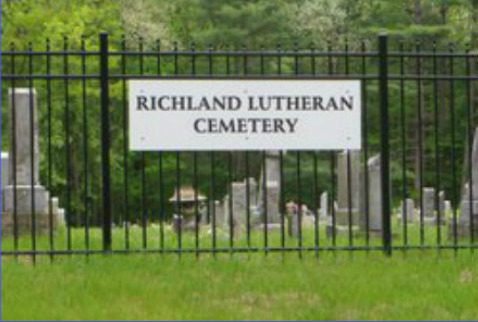 Click on the picture of the cemetery and you will be taken to the Richland Lutheran virtual cemetery. (findagrave.com). You may leave virtual flowers, notes, pictures, request any corrections, etc. of your loved ones. Click here for burial Guidelines. Click here for rules and regulations of allowable plantings, grave markers, etc.